AppNana is available for both iOS and Android that pays to download apps and complete various types of offers. If you regularly visit InfoSmush, then you already know about the apps that pay you to download other apps and how they work. But, if this the first time you came around such type of app: Apps like AppNana just share a part of their revenue with you. They get paid from companies that want their apps installed on your device. Since you are not gonna download the app for free they share a part of what they get. AppNana is a money-making app available for iOS and Android. AppNana pays you for completing various offers on your device. 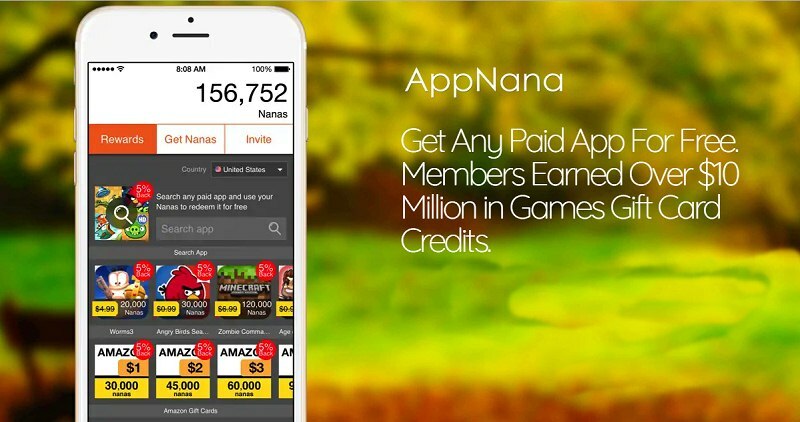 AppNana pays you in Nanas (points). For every offer, you complete you will earn Nanas. Like CashOut, Pocket Bounty and many other apps AppNana gives you points just for using the app daily. You will earn 400 Nanas for Daily Check-in. To complete these offers you need to download an app from the given list. Every offer has certain requirements to be met for you to get paid. Sometimes you just need to download and run the app. Sometimes register and sign up for a free trial. Usually, the harder an offer looks the higher it pays. You can earn from 500 to 25,000 Nanas per offer. You can also earn Nanas by watching video ads. But, the reward is pretty low. You'll only get 5 Nanas for 1 video. But, to claim this referral bonus you need to earn at least 15,000 Nanas. The same condition applies when you want to refer a friend. Your invitation code will only work after you have earned 15,000 Nanas. This means you need someone's invitation code who has earned 15,000 or more Nanas. Once, you have earned 15,000 Nanas enter this referral code: k25694529 to claim your 2,500 Nanas. You can redeem your points for tons of rewards including PayPal gift cards. PayPal, Amazon, iTunes, Google Play and Xbox are some of the rewards you can get from AppNana. Minimum Redemption: $1 Amazon Gift Card for 30,000 nanas and $2 PayPal cash for 45,000 nanas. Yes. I did some research and didn't find this app to be a scam. And all of the reviews are positive. So, AppNana is legit and not a scam. r26615609 use mine i have 15,000. You also have to have 15,000. No one can send you codes if you dont have 15,000. Mo one. Use mine t25082543 I have more than 15,000 nanas. Activate my code and reply to this comment with your code so we can exchange codes. Guys use my invitation code ...I have above 15000 so guess what?? Please input my code c27264488, have 15,500 but need 5 people.rply your code.